Peter and Oxana in their bobsled. Photo by Jon Lundin/Orda. It was the most terrifying 43 seconds of my life. But it’s not every day I earn gold-medal bragging rights from whooshing down an Olympics-calibre bobsled track. It’s possible, though, thanks to the folks at Whiteface Mountain near Lake Placid, New York. The picturesque village in the Adirondack Mountains was the site of two winter Olympics games — in 1932 and 1980. The facilities, including the bobsled run, remain in full use. Sure, things might have been a tad tamer nearly 40 years ago. Neither tracks nor equipment were as advanced as they are these days, when bobsledding Olympians reach speeds of 120 kilometres per hour (75 mph). But the Lake Placid track is where today’s U.S. team trains, and it will host bobsled’s World Cup in February 2019. If it’s good enough for the champs, I figure, it’s good enough for me. So, on a glorious December day, my brave wife, Oxana, and I head to Lake Placid, a three-hour drive from Ottawa. We booked in advance, since the experience often sells out, but belatedly worry we hadn’t updated our wills. Fear grows as we study a map of the storied track, reading worrisome minutiae: the track is 1,600 metres (5,250 feet) long, it boasts a 165-metre (540-foot) drop. We learn, too, folks can bobsled in summer on sleds tricked out with inline roller wheels, though that seems to be cheating. This is a winter sport, darn it, invented by the Swiss in the 1860s. Panic intensifies as we’re asked to sign a waiver. We don’t read it, on the principle that ignorance is certain bliss. 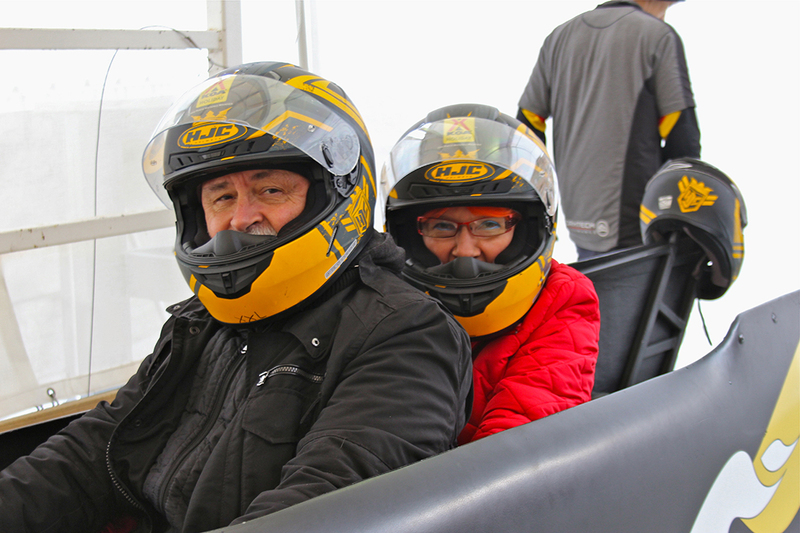 Soon we’re whisked to the top of the bobsled run, where our first order of business is to get fitted with a helmet — not just any helmet, but one that fits so snugly I must remove my glasses to put it on. Oxana keeps her eyewear, though that doesn’t much matter: her eyes remain closed. 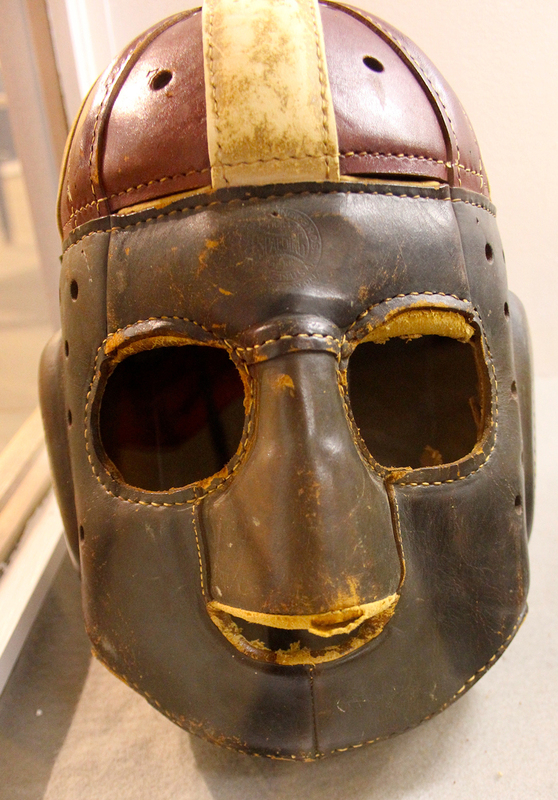 Early bobsled helmet. Photo by Oxana Sawka. We then clamber aboard our bobsled. Let’s just say that isn’t pretty. I try to squeeze my arthritic self into a sardine tin, legs splayed. Oxana snuggles close behind. We’re quickly joined by a driver in front and a brakeman in rear. (You didn’t think we’d hurtle down the glare ice track by ourselves, did you?) Each sled can hold up to three paying passengers — four if height and weight work out — so in fact, we have a roomy ride. The crew rocks the sled back and forth, pushes it forward, jumps aboard — and we’re off. One realizes there’s no turning back. Now things get fuzzy. Literally. Without my glasses, much is a blur. But I can see every twist and turn ahead and pray the driver makes each. He does, though Oxana later swears her noggin grazed the ice banks more than once. If so, the helmet worked. I become nervous again when the sled starts to slow down near the end of the course. There are brakes, but they’re supplemented by the track itself, with an unexpectedly steep rise meant to reduce speed. I feel the sled is about to somersault. I ought to know better. We’re nowhere near the competitive pace our crew is used to. Even so, hurtling at speeds up to 88 kilometres per hour (55 mph) and experiencing pressure equal to twice that of gravity is thrill enough. Back at the base we pose for a souvenir photo, pick up a souvenir pin and T-shirt, and realize we didn’t hear the live play-by-play coverage of our feat over a public-address system. We browse a small museum where we see just how primitive sleds were in the 1930s and thank heaven we didn’t use them. And we grin ear to ear, smug about conquering our fears. We’re delighted — until a greeter urges us to return to try the skeleton — a sport in which a participant goes down the track head first, alone. We simply nod no. She’s wearing a first-aid smock. We don’t want to give her extra business. 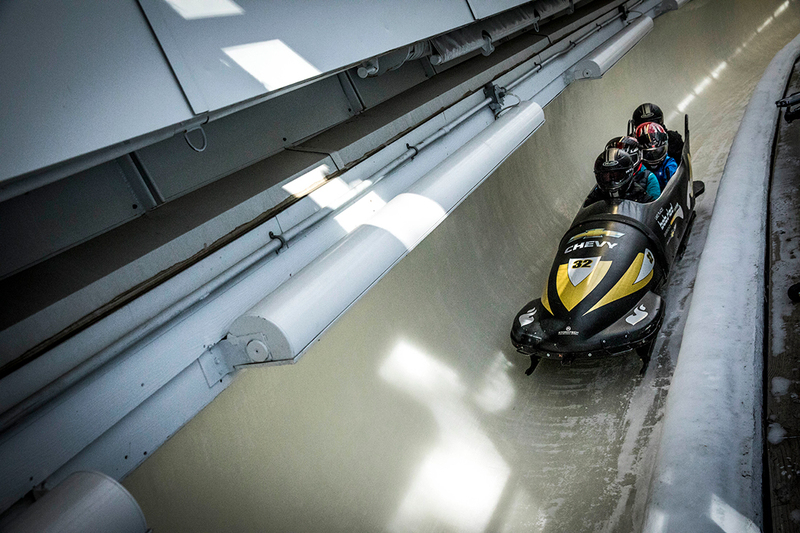 Bobsledding at Lake Placid. Photo by Adworkshop. Winter bobsledding runs December 22 to March 16. Hours are 2 p.m. to 4 p.m. Wednesday through Friday, and 10 a.m. to 12 noon and 1 p.m. to 4 p.m. on weekends. Because athlete training and weather conditions can alter the schedule, check whiteface.com for updates and other details. Prices are $95/adults, $90/teens and $85/juniors. Participants receive a 20% discount with the purchase of an Olympic Sites Passport, which provides access to all local Olympic sites. In Lake Placid, we enjoyed lunches at two downtown pubs. Lake Placid Pub is famous for its pear and maple pizza and Ubu Ale, a favourite of Bill Clinton’s. The Great Adirondack Brewing Company has a terrific steak salad and beer sampler served in a rustic carrier.